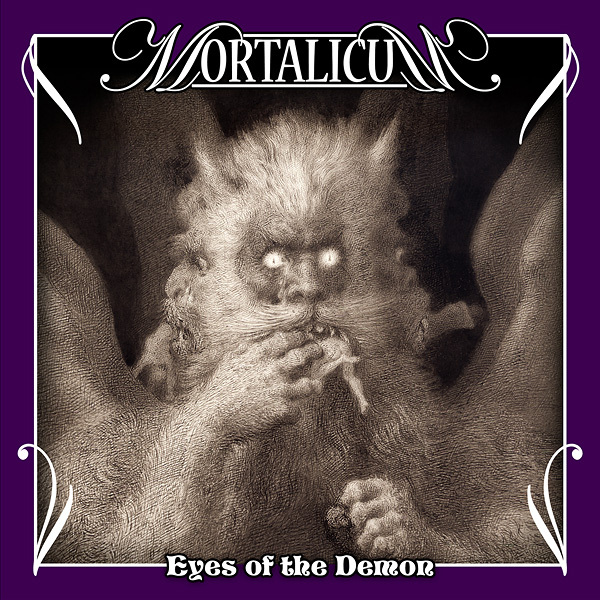 TITLE: "Eyes of the Demon"
You can always count on MORTALICUM when you crave old fashioned doom metal and heavy rock of the highest caliber. This Swedish power trio has a knack for writing memorable melodies and groovy, sometimes more doomy, sometimes more rocking and other times more bluesy riffs. On their 4th album you'll also find a wealth of nice and gentle moments and some damn fine guitar solos interwoven with awesome heavy outbursts, lots of jamming, fat, Sabbathian bass lines, powerful, natural sounding drums, and clean vocals with an emotional/melancholic undertone, perfectly fitting the music. All performed with inherent ease and finesse... a truly classy execution. The pleasantly warm organic sound typical of the '70s and early '80s heavy metal is like a balm for the ears of those who are fed up with modern plastic production. They clearly give a nod musically toward BLACK SABBATH, GRAND MAGUS, SPIRITUAL BEGGARS, RAINBOW, TROUBLE, DEEP PURPLE, THIN LIZZY, CANDLEMASS or SAMSON, but at the same time they have the ability to put their own identity to their songs. • 4th full-length album of this Swedish doom-rocking band.